I’ve had a creeping suspicion for some time that knowledge managers are fine about encouraging others to share knowledge, but that dictum doesn’t apply to them. In my role as President of iKMS I am always trying to get knowledge managers to share, and the ones who do are in the brave minority - even then, they tend to be far more reluctant to share in a public forum than in a private one. They have reasons, of course: lack of experience and confidence, lack of clear progress and successful results to show, restrictions by employers. But in such a young profession, with such instability of career progression and continuity of KM staff, with extensive inexperience among managers who are responsible for KM, sharing is about the only way to get access to experience faster. The obsession with success is an illusion born of that inexperience. We learn fastest through examining lack of success, and the more mature professions such as medicine and law and engineering recognise that. They have rituals for anatomising failure, and it’s not for fun, it’s because that’s how they learn and survive. “Exactly!” I thought when I read it. Anecdotal evidence, you might say. So I took a closer look at one of the most active international knowledge management discussion forums, actKM. 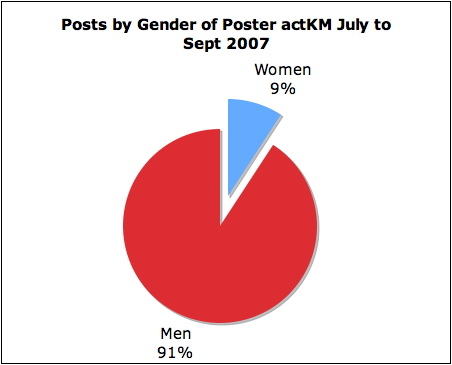 I took three months of posts, between July and September 2007, and analysed them for the identity of the posters, first by gender, and then by occupation. For clarity, Practitioner means somebody working in a knowledge management role within an organisation. Vendor means somebody who sells services or technology in the knowledge management space (I’m a vendor). Academic means somebody who primarily works in a university in teaching or research (though they may also sell services). I didn’t get as far as coding the posts for type of content, but any actKM regular will know that the conversation nowadays is rarely about practice, much more about theory, less about experience in KM, and more about opinion tournaments – some jousts more chivalrous than others, but tournaments nevertheless. Ask them to define knowledge or knowledge management, and you’ll have a month’s worth of hot debate. Make an enquiry about practical experience of conducting a knowledge audit or dealing with change management issues, and somehow they’ll turn it into a debate about the definition of knowledge or knowledge management. Forums like actKM seem to be ideal habitats for display behaviours – which males of many species (including the knowledge management species) seem especially predisposed towards. Who are the “females” in this game, one might ask? Why, the clients (the practitioners) of course, who sit passively by, not betraying any ostensible interest in the proceedings but observing nevertheless. actKM is more self aware than many communities, and has discussed “alpha male” behaviours on a number of occasions, but doesn’t seem to be able to get beyond them. And this kind of behaviour is not untypical of knowledge sharing behaviours generally in the knowledge management space. The published case studies, and those trotted out at conferences, are preening case studies perfectly designed for strutting the stage as well as for career portfolios – the knowledge managers who deliver them frequently end up as independent consultants selling their services. Which is why I’m starting to get disheartened about knowledge management’s ability to mature and even survive as a profession. We’re just not serious enough about learning for learning’s sake, to improve the practice in organisations, to advance the cause. The people who seem most disposed to learn and share are consultants, who float between contexts but rarely have sustained impact in one context. And sustained impact is essential for collective learning in knowledge management, because the feedback loop is a long one, it can take years of sustained effort for an intervention to show results. We’re in a vicious cycle of stop-start interventions conducted in silos, where nobody stays long enough to learn what really works and doesn’t work in the long run, where nobody is willing to propagate that learning as it happens. It seems to me (exceptional individuals notwithstanding) we are not bold enough, not brave enough, not generous enough, to survive as a profession. Tell me I’m wrong. Patrick - I’m not sure I can. I don’t think knowledge management will exist as a profession in 10 years. It doesn’t really exist now. The links between the component activities (and the skills required for them) are weak. And subject to ego-jacking. I am sure you are not familiar with the current weather in Israel, since it is gloomy as the spirit of your challenging post. My name is Yigal Chamish, and I am from the very first KM practitioners in Israel: between 1999-2004 I was the knowledge manager of the Engineering & Planning division of Bezeq, The Israel telecommunication Corp. More than that, since January 2001, I initiated, and still lead an on-growing group of Israeli KM practitioners which is called “The Israeli Knowledge Managers’ Forum”. Our vision is to contribute together to develop the body of knowledge on the topic of Knowledge Management. Since the end of 2004 I started a second professional chapter in my career and I am helping organizations and managers in Organizational Learning and Knowledge management processes. I am also a constant reader of your blog. All this info is just to say that reading your post made me think and also feel that it came right out of my head to my Blog...which (despite the fact that it is in Hebrew...) deals with these issues, very often, and continuously. (I also have a blog in English, http://yigalc.wordpress.com, however it less active). Hey guys! We want to hear the real story! What were the challenges? What were the obstacles? How you succeed to overcome? What are key success factors, and – What did you learn??? Wake up Knowledge Managers! After all you are bearing the torch of Learning and Knowledge within organizations! Don’t stay on the preacher stand only! I think to use the figures meaningful you would have to code for content. A lot of vendors have been practitioners or do a lot of sharing without selling, some sell without sharing. Also ActKM has always enjoyed a debate about definitions more that swapping experiences. One could argue that theoretical exchanges are more likely to create local capability than a context specific experience. Matt, I’m not sure that weak links between component activities, weak skills or proneness to ego-jacking are intrinsic barriers to building collective knowledge and learning. Medicine and public health and polar exploration had all three features too. They also had competition. The key in all three was the willingness to render practice observable, and to advance knowledge in the domain. Yigal - I wish I could read Hebrew! Dave, I’ve replied more extensively to you on actKM, but just wanted to note that I don’t think the theoretical exchanges are bad/wrong/harmful, just that we have a woeful lack of balance between that and practice-oriented sharing. If we don’t get practitioner sharing, we lose our rootedness, the practice always remains immature, and since we all depend on the practice of KM in organisations for our sustenance, our work also remains immature. Patrick - love the description of the lek although I think you might be pushing the analogy a bit far if you think that actual mating is happening as a result (although that might be a Singapore thing!). 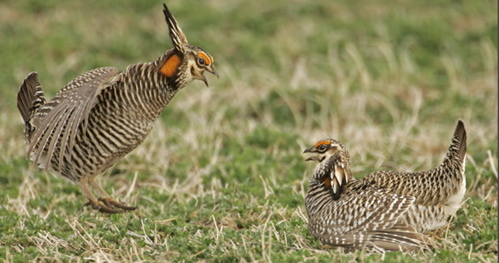 As an avowed birdo, there are many similarities here of breast-beating and turf-defending although I don’t see too many declared winners and losers - it just seems to be a perennial lek. Will the breeding season ever end? Perhaps at actKM we can have a real-life lek!! I’ll leave the determination of the prize to Nerida!! It would helpful for there to be a bit more review of your data. A cursory examination showed some misplaced categorisation (Richard Vines is responding more as a practitioner rather than a vendor, Lauchlann McKinnon is a vendor rather than an academic)and some people blur the distinction between whether they are a vendor or practitioner these days (I think Arthur Shelley is a bit that way - Org Zoo or Cadbury’s). Multiple identities don’t get categorised easily, particularly with people moving in and out of jobs and consulting roles. I’m not saying that Dave is a bully. On the contrary i think deep, deep down he’s a nice guy. But it’s not always fun playing in the same schoolyard as someone whom you know would thump you any moment. Yes I agree that there are multiple identities and partly acknowledge that in my post. The distinction I used was whether - as far as I could see - the poster was primarily “immersed” in practice inside an organisation, or primarily had an interest in selling KM products or services. This goes to the type of exposure you have to KM, whether deep and sustained, or wide and transactional. However I still believe (subject to challenge) the odd misclassifications are small in scale and have very little impact on the overall picture, which suggests that knowledge managers inside organisations share very little. Do you have a comment on that? I think that knowledge managers, as a rule, are so focused on trying to get a job done inside an organisation, that they do not look externally enough for inspiration, learning and sharing. This is one of the reasons why I set up up the APS KM group a couple of years back to try and get more sharing between departments happening in a safe trusting environment - with some success. I think that part of the issue here is whether sharing is occurring and if it is, in what spaces is that happening? Is it at conferences or networking events (like Melbourne KMLF, NSW KM Forum, etc), academic classes, books and articles rather than through online listservs like actKM? Perhaps something for you to explore at the actKM conference would be an exploratory exercise that investigates how and where KM sharing outside the organisation actually happens in practice? And I think there is something about current politician’s behaviour in warming up to the election with use of YouTube, etc - could this be e-lek-tion behaviour? Statement one is a factual statement, statement two is a theoretical one. Neither statement relates to behavioural characteristics. I have a rigid policy of only taking on experienced players in ActKM or obvious trolls like Frank. If you can find another example I suggest you provide it as evidence or withdraw a comment that I think is unworthy of you. Interesting observations. As an female amateur practitioner (KS/KM is a sideline to my main job) & an ex subscriber to the actKM list I decided not to stay in the list because I wasn’t interest in all the theoretical debates. There had been some good practical content at times - but not enough to make me stay on. Actually another female (vendor) & I had a few laughs about some of the rhetoric floating around in actKM - from memory it was something about who first coined the terminology “KM” ? It is interesting to see the vendor/practitioner split - of course some of the vendors listed in the spreadsheet used to be practitioners before restructuring in major corporations. 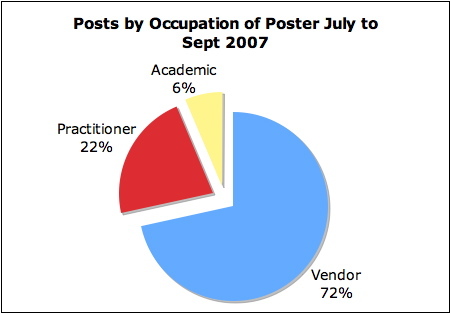 It would be interesting to note if their change from practitioner to vendor led to an increase or decrease in posts. Patrick - you might want to check your numbers. When I looked at the spreadsheet it did not conform with my recollection. Checking out the outgoing posts to ActKM in my in box it was 60% of your figure. You might also note that Matt was a vendor until recently and other categories could be challenged. The number of practitioners is if anything less that you state. I originally thought of working from my own archive, but I occasionally delete emails and sometimes post from other computers so I went to the web archive on http://www.actkm.org and copied the lists of posts directly from there, pasting them into Excel, each post going on a separate line. Then I went through and created an entry for name against each message, and made the count mechanically from there. I’ll take another look, but I avoided manual counts, so am not really sure why there should be a discrepancy. You have taken the humour out of me. While I think that your rebuttal is flawed (esp with regards to statement one being a fact), I do not wish to continue beating my chest. I withdraw my comment, and from the lek. I recall those days as an engineer we (my peers) are eager to share our experience with anyone who’s willing to listen; and we’re equally eager to know what others are doing, how they do it etc. n their project. Those nights sitting around the open-air cafe drinking teh-tarik (bubble indian tea) do resemble lek, but more like a lively CoP of collective learning. Now why the difference? Is there a difference between being an engineer and a knowledge manager? Are they less to show in KM? Or simply that K-manager is a natural selection of the alta males? I think the difference is that prowess in engineering is about being able to show observable results, so words can be checked against reality. In KM we still haven’t figured out how to make our performance observable, so the more confident ones will rest on their argumentation skills, and the less confident ones will keep quiet until they are confident they have something to show. That is a separate issue from the validity or otherwise of my statements. From memory over the last decade whenever the question of defining KM has come up, activity has been higher than for more or less anything else. It is not recent (my point) it is part of the nature of ActKM. Whether it is right or wrong is another matter. I made no comment on that, and have more or less avoided engagement with such debates in recent times. In the six month period there were 139 posters. Patrick’s data over three months has 98. There were 97 males (70%) and 42 females (30%) in my analysis. There are 77 males (79%) and 21 (21%) females in Patrick’s analysis. The high volume posters in my analysis were, Maloney, Snowden, Lambe, Moore and Firestone. The high volume posters in Patrick’s analysis are Firestone, Snowden, Bound, Lambe and Moore. Will Knowledge Management ever be a profession? Depends on whether you see it being confined to being a discipline within management science or it has the potential of growing and standing on its own. Perhaps we should take a look at how other professions came about. E.g. how did library science become a profession? What about patent agents/patent engineers? What were the driving forces that caused these professions to come about? My sense is that they came about because there was a demand by society in the first place, and therefore there was the supply. Until and unless CEO’s deem KM as one of the key factors to their companies’ survival and success in the knowledge-driven, globalized world, KM will have little chance of becoming a profession. A side note about future professions. Given the tremendous growth in recent years of websites organized based on the concept of the Social Web, will we one day have professions like Youtube Video Censorship Manager, or eBay Seller Credibility Checker? The answer probably lies with supply and demand. Dave, I remembered your keynote speach at ICKM2004 conference in Singapore when back then you declared the death of KM. It looks like five years later on neither KM faded away nor Dave Snowden changed his position. KM adoption was very slow in the US, but recently we are seeing a strong interest in KM within organizations and the academic community. The driving factors for KM are still there and I believe KM will establish itself one day as a profession along line of similar areas such as project management. I hold to my view Suliman - I said then (three years ago by the way) that KM was at the end of its life cycle. Adoption by Government and by academics is further evidence of that. KM adoption was very FAST in the US post 1995, and by 2004 had fallen significantly. Academics did not even come into the field until after its peak towards the end of the 90s. To take a related area - most people involved in social computing avoid the KM label like the plague and for good reason. Conferences have moved on, with KM at best combined with other (mainly IT) subjects. Yes there are more academic conferences, presenting papers but that is not the same thing I am afraid. The subject matter lives on,but with different names. If the best KM can achieve is the professionalism of project management, then god help it. There professionalism (if you can call it that) means stagnation. At the end of the day, a rose by any other name is still a rose. So, whether you call it Balanced Scorecard or business strategy by gut feel by experience, does it really matter? Whether you call it Five Forces Model or Sun Tzu’s Art of War, does it really matter? Whether you call it KM or organization development, does it really matter? Where’s the beef? What really matters is the essence, and does it bring value to the table? That is what matters. Dave, by the way, you spelt “god” wrongly. The word should be spelt “God”. And please don’t mock the professionalism of project management. There are more project managers out there than “knowledge managers”. And we are all doing very meaningful work that brings real value to the organizations we work in. I agree with Siew Ning, the label is not that important. The name of the game in the knowledge economy is Interdisciplinary education. The word interdisciplinary might be two academic but that is really what characterize many disciplines such as MIS, project management, information architecture, and so on. Most of the graduate students nowadays are adult students looking for skills and competencies that allows them to adjust to the changing work environment. If KM as a interdisciplinary subject can meet the increased demand for interdisciplinary education, It will continue to be relevant. Mind you it shows the attention to critical detail that you get in a really high quality, professional project manager. I realise the error of my ways. If this had gone uncorrected all sort of dire calamities would have ensued. The success or failure of Project Managers, is not the same thing as the “professonalisation” of project management. It might be an idea Siew Ning to apply the same level of application to reading what I said and thinking about it, as you did to the appropriate use of capitals. The term, “professonalisation” of project management is an uncommon term. Some definition is needed. (1) the fact that there seems to be more and more project management certifications (e.g. PMP, CITPM)? (2) project manasgement (best) practices being captured and sold as books? (3) more proejct management conferences and seminars seem to appearing?